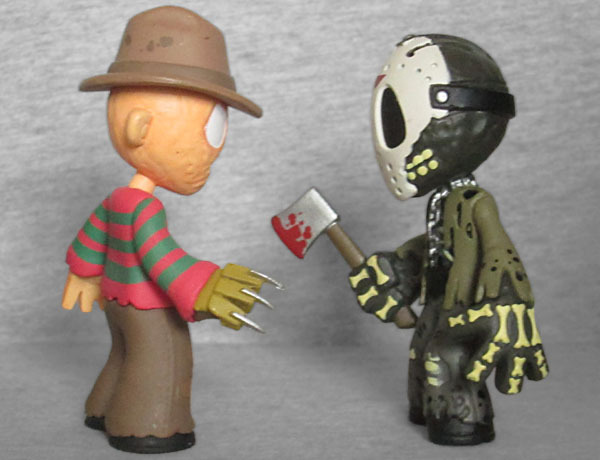 Freddy was available in Series 1 of the Horror Classic Mystery Minis, but I didn't get him then - I picked him up later during a sale at my LCS. But sadly, they didn't have his sparring partner, Jason Voorhees, at the same time. But then Series 3 came out, with a new Freddy and a new Jason! And... 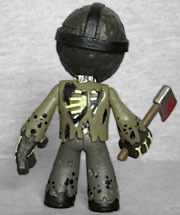 I was never able to find the 1:24 Jason (despite once finding the 1:72 syringe-fingered Dream Warriors Freddy). This year, Walgreens got a surprise re-release of Series 3 (with a few exclusives), and this time, Jason was down to 1:12. Thanks, Walgreens! This Jason is based on Friday the 13th Part VII: The New Blood, the first to feature Kane Hodder, the most famous guy to play Jason. At the end of Part VI, Jason was chained at the bottom of Crystal Lake (which, if it were even half as clear as its name implies, means he should have been readily visible to anyone who happened to look into the water), before being freed at the beginning of Part VII. He'd been submerged for at least a decade before the chain holding him down snapped, so a lot of his body has been nibbled at by the fish - bones are visible on his hands, knees, chest and back. The remnants of the chain hang around his neck, and he's armed with a bloody axe. 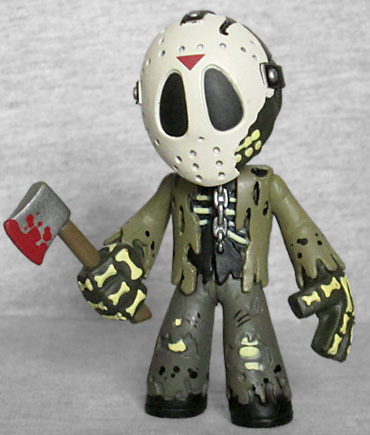 For some reason, the Mystery Mini does Jason's skin as a very, very dark grey, rather than the lighter greyish-brown it should be. The art of the character on the box shows it the proper way, so something must have happened during production. The bones are slightly more yellow than his mask, which is most easily seen by looking at his teeth - at the end of the previous film, Jason was finally "killed" by a boat's outboard motor, which apparently managed to chop through the side of his mask before breaking his neck. Between that and the axe wound on the forehead, we can see that the Friday the 13th series has a better grasp of ontological inertia than the Transformers movies do. I may have liked having the Series 1 Jason more than this version, but I'm not going to be picky. All I really wanted was someone to face off against my Freddy, and he does that well. This entry was posted in blog exclusive review, Funko and tagged Friday the 13th, Mystery Minis, Nightmare on Elm Street. Bookmark the permalink. I'm bummed I missed the Series 1 Jason, but I'm still really glad to have this one -- I like the post-decay look Jason had in the later movies, even if the films had definitely declined in quality. Oh yeah, that would have taken things to a whole new level. Did you ever manage to get one of the glow Cthulhu Mystery Minis?